Left to themselves, each of the world’s 40,000 fish species probably has its very own diet. But pet store selections are considerably more narrow. How can you decide what’s best for yours? The most common kinds of foods include flakes, floating and sinking pellets, sinking wafers, freeze-dried feeds, frozen foods and live food. Most fish should be fed once or twice daily. Don’t give them more than they can consume in about 5 minutes. When choosing a food, keep in mind that certain kinds of foods leach essential nutrients into the water, which could deprive fish of the nutrients they need. Pellet and granular feeds, which fish swallow whole, tend to be more nutritious and less vulnerable to leaching. Water-soluble vitamins are another story. Many of those vitamins are lost in the water within 30 seconds of feeding. While most saltwater fish drink seawater and can capture them, freshwater fish can’t. While some manufacturers claim that a certain product can provide all essential nutrients, we advise you to vary your menus, including fresh vegetables. Because of species diversity, age and size differences and varying levels of activity, it is almost impossible to list specific nutritional requirements of all pet fish. However, a few general considerations are worth mentioning. Fat. 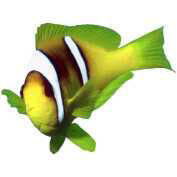 Ornamental fish obtain most of their energy from ingested fat. To avoid fatty-liver disease, however, fat shouldn’t exceed 15 percent of a fish’s daily intake. Carbohydrates. Fish don’t require carbohydrates, although a number of species utilize hindgut fermentation (much like a horse) to digest complex carbohydrates. Fish that can’t digest carbohydrates excrete non-digested plant matter. Protein. Most commercial pet fish diets list protein as the largest percentage of dry matter contained in the feed. Like other vertebrates, fish require 10 amino acids, all of which are available in animal protein. While some commercial diets contain plant protein as part of their total protein, animal proteins are best since they are easiest to digest. Feeder Fish. If you have certain kinds of piscivorous (fish-eating) fish, they will only accept live food. Don’t use goldfish, guppies or other “feeder fish,” which can carry parasites and other contagious diseases. Consider earthworms, bloodworms, black worms, tubificid larvae (tubifex worms) and brine shrimp, which generally present less risk of disease. Commercially produced and packaged fish feeds usually don’t list an expiration date, but you should replace them every 6 to 8 months. Store flake and pelleted feeds in sealed containers, ideally in the refrigerator.